1Insert a writable CD into the appropriate drive or a flash drive into a USB port. You can back up to any disc or storage device you can write to, such as a writable CD or flash drive. You need to know only which letters your computer uses to label its drives. If you don’t, consult the documentation that came with your computer. 2Verify that the file you want to back up is active. 3Start the backup operation by choosing File→Backup and Restore→Backup Quicken File. 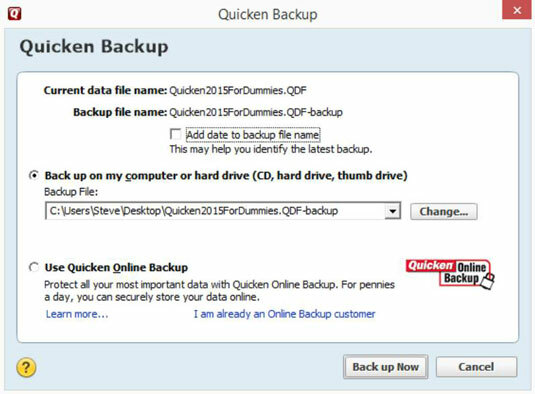 Quicken displays the Quicken Backup dialog box. Select the Back Up on My Computer option button. Then verify that the disk letter shown in the text box is the one you want to use for backing up. If it isn’t, click the Change button. 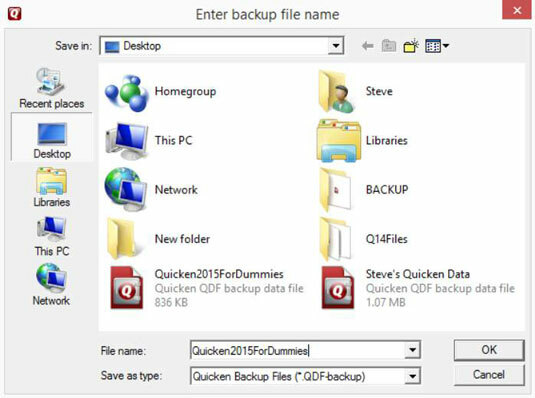 When Quicken displays the Enter Backup File Name dialog box, select the correct disk. You can use any removable media, including a flash drive, a recordable CD, or even an external hard disk. You see a warning message if the file you want to back up is too large. In this case, you need to shrink the file, use a different disk, or use multiple disks.